I live in Riga. If you look up what this means, you will most likely read that Riga is the capital of Latvia. This is an entirely true sentence, but leaves out so much that it might as well be false. The reason for this is the multiplicity of people who have lived in the city – its location halfway up the eastern coast of the Baltic Sea making it perfectly placed for trade both with Scandinavia and Western Europe, and with Russia. The territory of what is now Latvia has at different points been occupied by Germans, Swedes, Poles, Russians and Soviets. You can fill in its jerky history by looking at its spire-studded skyline from the island suburb of Ķīpsala – here a bulky German-built cathedral, intended to shelter the merchant class at prayer; there a grapefruit-yellow miniature castle, scarlet Latvian flag flying, a 14th-century fortress repurposed as the president’s home; at the end a tawny, jagged building, rising and sharpening in geometrical lines, a 1950s present from the Russian Soviet Socialist Republic. Riga has, at times, made history: birthplace of Isaiah Berlin, location of the peace treaty signed between Poland and Soviet Russia, probably the place where the Christmas tree was invented. But more often, history has happened to Riga. It is my home, and in certain moods I think that it is the city I love most in the world. But, for all its beauty, it’s a tough place to live: developing fast economically, but still very poor by Western European standards; pleasantly cool in the summer, but far below zero for most of the winter. It’s ethnically divided, roughly half Latvian and half Russian, and while they rub along fine in everyday life, it only takes a significant anniversary to show how different their interpretations of history are. The autumn I moved there to start teaching English was one of the most difficult of my life. Riga can be a forbidding and dark city when the mood takes her, seeming made up of decaying industry, featureless Soviet blocks and frilly, officious 19th-century buildings. The weather in the autumn varies between a kind of yearning Indian summer, filtered through constantly shifting clouds, and rain (sometimes snow) of a truly spiteful ferocity. I mainly remember the second three years ago. On those mid-autumn mornings, the city seemed to be drowning. Rain swept up and down the streets. Each and every source of light got its own little wreath of damp, sticky fog; traffic lights and neon signs took on the role of beacons. People shouldered their way through, undaunted but unhappy, their faces set in taut lines of resistance. The local people seemed no more inviting than the weather – Latvians can be monosyllabic, sour and touchy, especially to outsiders. I felt consumed by enthusiasm to fit in, to understand, and yet offended or pissed off locals with depressing frequency. Latvian is a Baltic tongue, thus resident of an idiosyncratic linguistic cul-de-sac, related only to Lithuanian and deceased Old Prussian; barely any of the words looked anything like anything I’d ever seen before, and it became clear that learning the language to any reasonable standard would take years. The whole thing seemed a failure before it had even started. It was after a few weeks that I wandered into an English-language bookshop not far away from where I was working. While browsing through the titles on display, a number of which were slightly strange – I remember one called 100 Years of Wolverhampton’s Airports – I noticed, propped up on top of the shelves, a dusk-blue hardback with a simple, sweeping title, chiselled in wedge-shaped gold letters: Latvian Literature. This might help, I thought. What I thought I would get was something like a greatest-hits rundown from the nation’s best-and-brightest writers. But after taking it home and flipping through a couple of times, it became clear it was something quite different. The first giveaway was the publishing location – Toronto; the second the date – 1964. This could have only been published by refugees. 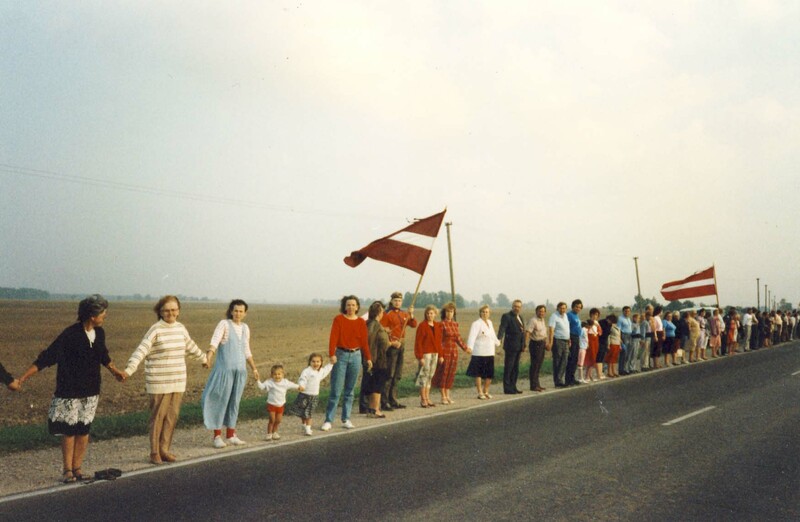 A lot of Latvians became refugees over the course of the twentieth century, as many as a quarter of its population after World War II. The fate of the Baltic nations is one that is usually overlooked in an era of larger, noisier tragedies. Latvia had won independence for the first time in 1919, taking advantage of the Russian Revolution and Civil War. In 1939, the Soviet Union strong-armed the little country, under threat of invasion, to accede to the placement of its armed forces on their soil. A year later, the threatened seizure of power went ahead regardless. The period that followed is still known as “the terrible year”: mass executions took place; thousands were deported to Siberia; the nation’s leadership and intelligentsia suffering especially disproportionately. I struggled with Latvian Literature for quite a while. It was long, patchy, varying wildly in theme and quality; the scratchy font gave me a headache, and the translation was sometimes extremely clunky. What’s more, despite the authoritative tone of the title, this was clearly a decidedly low-budget production: the pages were curdled cream, not quite neatly assembled and micrometres too thick for frictionless turning. There were points at which I wondered whether it had been actually been hand-produced on a typewriter: certain ink-drenched letters seemed testaments to impassioned hammering of the keys, characters occasionally jumped inexplicably off the line. The explanatory diacritics necessary to guide pronunciation of Latvian names were present only inconsistently. I remembered showing it proudly to a Latvian friend who was very knowledgeable about literature, and being surprised that she had heard of less than half the writers featured. After a while I got it: this was not a showcase for all the best that the literary tradition had to offer; it was an assemblage of anything that could be scraped together given the straitened circumstances – an odd mix of genuine classics and the works of the refugees, those brave cussed souls trying to make a career writing in Latvian in an indifferent country. Something about the whole brave enterprise reminded me somehow of children pressing the pieces of a broken toy together, hoping to make it whole through sheer need and determination. I remember reading this and just thinking “why?” The military boots pressing down on his homeland’s chest would ensure that any work would not see publication there; his escaped compatriots were driftwood scattered across the Western democracies. While this didn’t seem the moment for an explicitly Latvia-themed fictional work charting the growing confidence and assertiveness of the culture, I was affected by its existence at a time when the spine of that culture seemed to have been well and truly snapped. Knuts Lesiņš, author of the nostalgic and wonderful story “Christmas at the Old Farm”, is represented, in lieu of the other contributors’ scribbly portraits, by a photograph of a bronze bust of his head. The accompanying text states “he was a dramatist at the Latvian National Opera, but since 1950 has been a piano instructor in Minneapolis, Minnesota”. Stripped of the context of Latvia, all that remains is the sheer incongruousness: a piano teacher honoured by having his head cast in bronze. Others have found jobs that seem totally out of keeping with pre-war occupations – true, many are translators and academics, some are teachers – but we’re informed about another that “she has a desire to work with deaf children”; about one Alfrēds Jaunzems, we’re just told that “at present he works for Wilson Plastic Signs Co., Ltd., Toronto, Canada”. Although its contents are mixed up and inconsistent, it’s certainly not true that the collection is of interests primarily or exclusively because of the manner of its genesis. Of the number of excellent stories, the strongest is “In the Shadow of Death” by Rūdolfs Blaumanis, which fixes on a phenomenon unique to Latvia and the surrounding countries to illustrate a fundamental human truth: It tells the story of a group of men trapped on an ice floe, which broke away from the mainland while they were fishing – something that is an occupational hazard in Latvia. It’s almost existentialism avant la lettre, as the men, a diverse assemblage, if not quite a cross-section of Latvian society, try to deal with the problems of fear, conflict and thirst, glossed sympathetically but unromantically, while they wait for a sail to appear. Relatively few of any of the stories address the war openly, as though the writers are frantically trying to avoid thinking of it – a rare exception is “The Letter from Kurzeme” by Velta Toma, in which scenes of the fierce fighting for Latvia’s westernmost province burst in on a 1960s Canadian Christmas. Uncomfortably, the titular letter was sent by a member of the German army – caught between two greatly larger powers, and with attempts to restore independence abortive, Latvians were conscripted and died for both forces. With their recent history so depressing and compromised, Latvians often take solace in vague conceptions of a free past, prior to the arrival of German missionaries, when, in popular belief, Baltic tribes formed an egalitarian, hearty society perfectly in tune with nature and human needs. A consequence of having been dominated by foreign powers for almost the entirety of their recorded existence is that the “golden age” which Latvians look back to is not, unlike most European countries, a period of territorial expansion, but one when, simply, they were unknown to the rest of the world, left to get on with their own thing. Even prior to World War II, it could be fairly stated that exile was the default mental state for a Latvian: if they are in Riga, they should be in the countryside; if they are in the countryside, they should have their own farm; if they have their own farm, then they should be living wild in the forest. This perhaps feeds into the unformulated pantheism one comes across so frequently, most strikingly and appealingly in Jānis Akuraters’ “The Young Farmhand’s Summer”, an almost plotless tale which is like Thomas Hardy on uppers, everything uniting in a miraculous loving coherence, rather than everything working together to destroy you. A representative quote is below: “I go again among green valleys, amidst the scent of alders, and hear a corn-crake calling near a wheat-field. An expanse opens before me, wide and endless, and I am there where the wind blows and the white clouds of sky rest; where trees hum with bees, and linden-trees bloom on the overgrown banks of rivers”. There is, undoubtedly, a profound reverence for nature that is, at root, perhaps even the initiator, of all Latvian culture. Young people will know the names of flowers and trees, understand herbal remedies and often be in possession of rather dubious religious convictions – the Baltic neo-pagan movements (Dievturība in Latvia, Taarausk in Estonia, and Romava in Lithuania) are among the strongest in the world. From “The Young Farmhand’s Summer” again; this time a description of the behaviour of trees in a storm: “in the greatest storm, when all trees seemingly united in one incomprehensible swell, one could distinguish the soft rustle of the linden, the compliant chatter of the high arching willow, and the firm organ-like hum of the oak” – not many could distinguish these types of tree from their sound alone, not many could apply meticulously selected adjectives to each one; Latvians of this type can. This book was an attempt at a cogito ergo sum for the free Latvian nation: proof to the outside world that there was a country called Latvia, that Russia did not just roll on until the Baltic Sea, whatever the map might suggest. There are examples all around them of countries that have become partly or wholly Russified (look at Ukraine for a particularly topical and knotty example of this), that have lost their culture, their language and had foreign narratives of their identity and history forced upon them. That did not – quite – happen to Latvia. And I’m still in Riga, still trying to understand better. I absolutely loved reading this piece. So well-researched and interesting. I learned a great deal. Thank you. This was a pleasure to read. Thank you so much for sharing your insights in such a sincere way. An interesting article. I do think that ‘the bolshy nationalist grandfather’ was a clumsy choice of words. This nationalist grandfather would surely not have been a ‘bolshy’ to have been targeted for a trip to Siberia. Thank you for your series of articles. Wonderful.